Successfully Added Waterproof MP3 Player - FM Radio, Long-lasting Battery, IPX8 Waterproof, OLED Display, 8 GB Memory, Waterproof Headset to your Shopping Cart. The IPX 8 rated MP3 player allows you to listen to music when doing laps in the pool. The built-in battery can last for a long time giving you plenty of time to enjoy music. You can store thousands of songs thanks to its 8 GB storage space. OLED display lets you keep track of time and song. 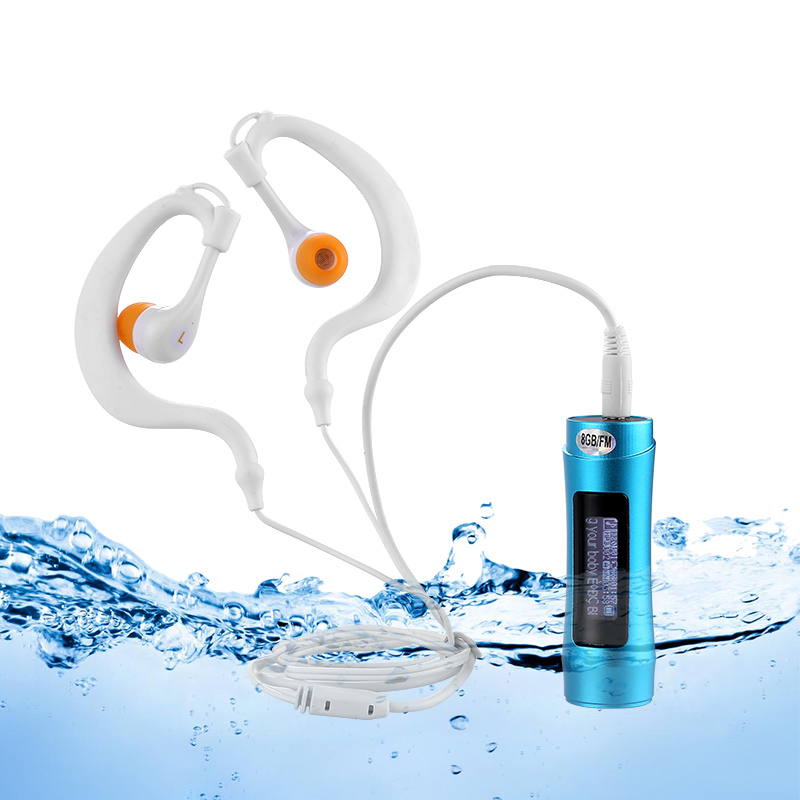 The Waterproof MP3 player is designed to be effective and efficient in water. This MP3 player meets the standards of IPX8 and can withstand submersion up to 10 meters. So, you can even enjoy music underwater without worrying about the player getting damaged. This MP3 player has gone through series of tests, this makes it reliable and durable. The MP3 player has a long-lasting built-in battery that lets you enjoy music for up to 8 hours on a single charge. The charging time of the MP3 player is 2 hours. With an OLED display of the MP3 player enables you to see the time, distance covered and the song playing. Moreover, it allows you to view the song information as well. The screen resolution of this player is 128 x 32, big enough for you to read text clearly. This MP3 Player has 8 GB of internal storage that enables you to store thousands of songs. You can easily save the media library of your computer on this MP3 player. It comes with a USB plug and plays function that requires no drivers. This player supports the WMA and MP3 music format. The Waterproof MP3 player allows you to listen to FM radio. A great thing about this MP3 player is that it is compatible with both MAC and Windows OS. This makes it easy for you to connect the MP3 player. The package of the MP3 player includes an MP3, a headset, a cleaning cloth, sling, and USB. It comes with everything you need to enjoy your favorite music in water. You won’t have to spend money on getting a waterproof earphone, the MP3 player comes with a headset that is specially designed for flip and turns. The cord of the headset is short that will never get tangled. Whether you are a professional swimmer or you swim occasionally, the Waterproof MP3 player is the best choice. When you get this MP3 player, you will be spending less time on adjustments and more time on swimming. This waterproof MP3 player is available with a 12 months warranty. It is brought to you by the leader in electronic devices as well as wholesale audio gadgets..